As part of a free summer movie series, I’ve been watching older movies with my kids at a local theatre. Some are modern: Cloudy with a Chance of Meatballs, How to Train Your Dragon. Some are classics: The Princess Bride, The NeverEnding Story. And some are in between, throwback films that aren’t perfect but have the power to immediately take me back to my childhood. Homeward Bound is that sort of movie. It’s based on the Sheila Burnford novel The Incredible Journey, which is also the film’s subtitle. It’s an excellent book, worth the read, but completely different from the film. My sister & I watched the movie version many times as kids, and the lines still have the power to make me laugh even after all these years. But it’s the heart that really gets me, perhaps 10 years after the last time I saw it, bringing tears to my eyes in a way that only the most meaningful stories can do. This is the tale of three special animals and the will to survive no matter what. Shadow, Chance, and Sassy are the extremely loved pets of the Burnford clan, members of the family really. Shadow is the wise old retriever, a solid companion & loyal dog. Chance is a rambunctious young bulldog, a trouble-maker to the core. Sassy is a beautiful Himalayan cat, a pampered feline who thinks she’s tops. The trio couldn’t be happier, but when the Burnford’s move homes, things take a turn for the worse. The animals are only meant to stay at a nearby farm for a short time while the family gets settled, but they feel abandoned and Shadow thinks that something is wrong. So they leave the ranch, head into the mountains, and make their way back to the home that brought them so much happiness. But the wilderness is no place for house pets, and their survival is not guaranteed. 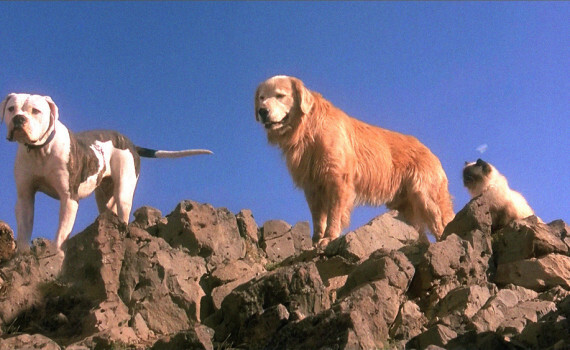 Homeward Bound is one of those movies, if you saw it when you were ten, that sticks with you forever. I still quote this movie to this day (cats rule and dogs drool!) and hearing those lines again on the big screen was something I’m glad I experienced, especially with my kids. Michael J. Fox as Chance, Don Ameche (Cocoon, Harry and the Hendersons) as Shadow, Sally Field as Sassy; the voices could not have been done better. And the film has an incredible 90s feel, from the outfits to Robert Hays (Airplane!, Cat’s Eye). The emotions of course, can’t forget that, the way the kids love their pets and the way the animals work so hard to find their way back to the people who need them; it’s a powerful story, in book or movie form, and when those dogs race toward those they’ve sworn to protect I dare you to stop yourself from at least some misting of the eyes.